GIE Associate Editor, Dr. Lyndon V. Hernandez, MD MPH, highlights this article from the January issue “Quality assurance of colonoscopy within the Dutch national colorectal cancer screening program” by Maxime E.S. Bronzwaer, MD, et al. In 2006, Barclay et al showed in their landmark study in The New England Journal of Medicine the association between colonoscopy withdrawal time and adenoma detection rate. Several studies have since shown the value of monitoring performance metrics for colonoscopy. Twelve years later, we we have witnessed the growth of national quality assurance programs for colonoscopy in several countries. The Dutch colorectal cancer screening program (CRCSP) is a comprehensive, continuously evolving system of accreditation and quality assurance using a centralized database system. This study highlights how endoscopists, public policy, and the healthcare industry can work together to help reduce colorectal cancer deaths. 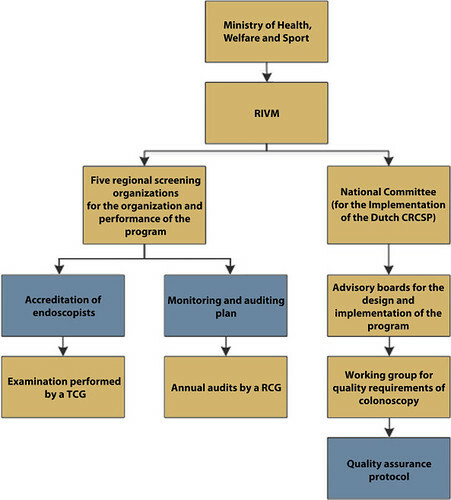 Organizational structure of the quality assurance program of the Dutch colorectal cancer screening program (CRCSP). RCG, Regional coordinating gastroenterologist; RIVM, National Institute for Public Health and the Environment; TCG, test coordinating gastroenterologist.